Plastic Pink And Red Frooti Basket. 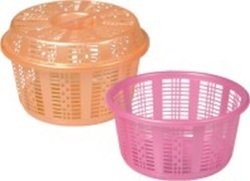 We offer an exclusive assortment of plastic colanders, plastic baskets, fruit baskets that are offered in a plethora of designs, sizes and colors. 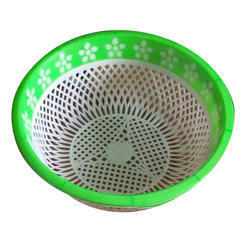 Used for washing or keeping all kinds of fruits and vegetables, our range of plastic colanders/baskets is offered at industry leading prices. Fruit baskets are highly appreciated for their best quality. Best quality plastic material is used in manufacturing fruit basket plastic product.we are offered High quality & attractive price on all our products. We take pleasure to introduce ourselves as one of the renowned firms for providing the best-in-class range of Plastic Fruit Basket. Made from Top- notch and durable quality plastic granules, Sardar Shakti's (Brand of peesons Polymers Pvt. We are engaged in offering Plastic Fruit Basket. Color: Red-White, Blue-White, Green-White, etc. Boss Jindal Shaktiman Pink Plastic Fruit Basket 22"
We are offering Plastic Fruit Basket to our clients.